The simplest forms of microscopes are very rudimentary, consisting of only one lens and able to only slightly magnify an image. The invention of the compound microscope by Zacharias Janssen in 1590 was groundbreaking in the microscope field and gave scientists access to a whole new microscopic world. There are some very obvious differences between the two types of magnifying instruments. A compound Microscope is called “compound” because it compounds the light by passing it through two or more lenses in order to magnify. You have a lens near the object being viewed, known as the objective lens, which produces an enlarged image of the object naturally by passing the light used to view it through curved glass. An additional lens, called the eyepiece lens, is where the real magnification happens with a compound microscope. The eyepiece lens will magnify the already enlarged image from the objective lens, making it even larger. A simple microscope is described by the Encyclopedia of Britannica as any magnifying object using only one lens. The simplest microscope ever invented was the magnifying glass. The focal length, or the distance between the lens and its focus, is relatively short with a simple microscope. A magnifying glass, for example, only focuses in one area and one must move the lens until the object is in focus and then we see our magnified image. It is similar with compound microscopes however the magnified image from the objective lens becomes the focal point for the eyepiece making the overall focal length longer and more precise. In a compound microscope, the original magnified image is projected inside the microscope cylinder somewhere within the second lenses focal length. This allows the second lens to again magnify the virtual image from the first lens and provide an even larger depiction of the object. The magnification of a simple microscope is fixed. It magnifies the image to the degree that the lens allows it to. If a simple microscope was able to produce an image times 10, that would be the magnification you are able to see and no more. The magnification of a compound microscope can be multiplied because of the additional lens. If the objective lens on a compound microscope magnifies times 10 and the eyepiece is able to magnify times 40, the overall magnification available to you is 400. This means that the resulting image is 400 times larger than the size seen by the naked eye. What Are the Functions of Condensers in Microscopes? Erickson, Michaelyn. "Differences Between a Simple & Compound Microscope." 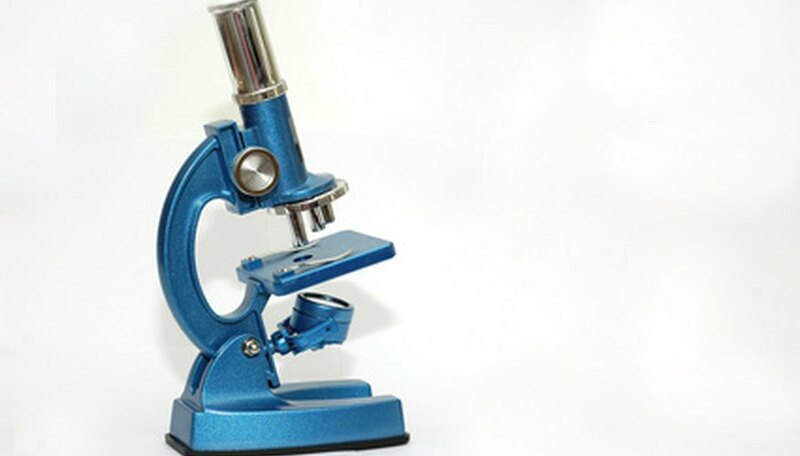 Sciencing, https://sciencing.com/differences-between-simple-compound-microscope-7205469.html. 24 April 2017.